Vice President Michael Pence, in a speech to the Christian Broadcasting Network, said the U.S. “must establish space as Christian territory,” and vowed to launch the first “orbiting church” before the end of the President Donald J. Trump’s first administration. 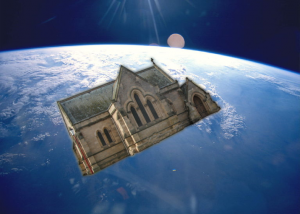 Pence’s vision: an American-owned “First Christian Church of Outer Space.” The vehicle would measure 240 feet in width and 185 feet in height, making it bigger than the Crystal Cathedral, in Orange County. At a news conference following his speech, Pence was asked if the orbiting church would have all the usual accoutrements of a traditional church: pews, altar, statues, naves, even a steeple. “Yes, of course. Why not? That’s what God wants.” he replied. 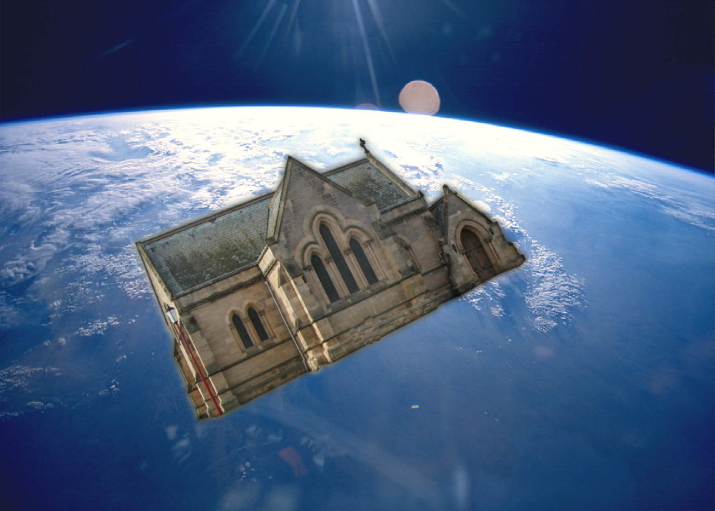 According to an official close to Pence, who asked not to be identified because he was not authorized to speak to the media, Pence has decided on a design for the orbiting church: a neo-Gothic-style structure, similar to the church Pence attends in Indiana, with stained-glass windows, that would orbit the Earth directly above the Equator, at an altitude of 22,000 miles.